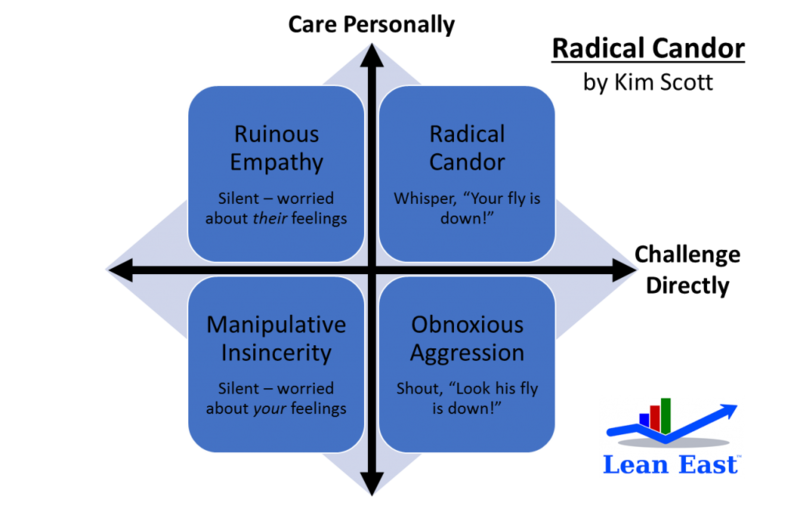 Scott shares the concept of Radical Candor on a 2X2 grid with one axis how much you care personally about the person and the other axis how much you challenge directly, (i.e. “be brutally honest”). Scott names each of the four quadrants and shares a simple example to describe each. Imagine you notice one of your employees walking into a big meeting with the zipper on their pants down. How do you respond? Challenging directly means you will tell the person about their zipper so they can fix it quickly. If you care personally about the person’s feelings you should privately whisper “Your fly is down,” so your employee can fix and move on. This is radical candor, and is always recommended! Challenging directly without demonstrating that you care personally is obnoxious aggression. An example would be saying aloud, “Look, his fly is down,” and pointing at the employee. The employee gets to fix the issue, but not without some embarrassment. What if you care personally about the employee (and really don’t want to hurt their feelings) but also don’t bother to challenge directly? In this example, you are silent since you are worried about making them embarrassed. Later the employee will wonder why he wasn’t told about his fly being down. This is ruinous empathy, and is probably most commonly how I observe leaders behaving. Being nice will slowly ruin your team and relationships. Most people want to be challenged directly so they can improve, yet time and time again I hear leaders complain about their employees without ever giving direct feedback to the employee. The last quadrant is the worst, when you neither care personally nor challenge directly. These leaders stay silent because they are worried not about the employee, but about themselves. Scott calls this manipulative insincerity and it does not build trust between the employee and leader. Colin Powell said leadership is sometimes about being willing to piss people off. If you really care personally about people you need to help them with direct, honest feedback. I spoke with a successful business leader recently who hired a consultant to help her grow her business. “He was a real jerk,” she explained, and made her cry after many of their early meetings. But he also challenged her directly where others did not, and because of his pushing, her business took off. One paradox about being a good boss is that most people prefer the challenging jerk (obnoxious aggression) to the boss whose “niceness” gets in the way of candor (ruinous empathy). 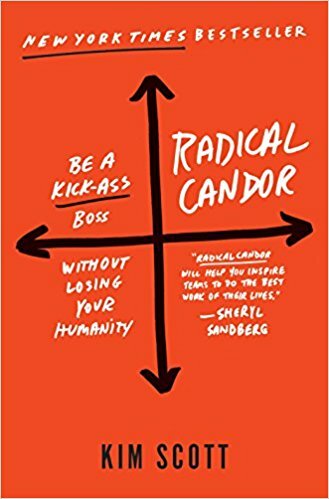 A leader who wishes to move towards radical candor with their team should begin by asking each direct report for their radically candid feedback of the boss. Don’t dish it out before you can take it. Scott recommends having regular 1-on-1 meetings with your staff where you can provide each other radically candid feedback. Leaders should use these 1-on-1 discussions to learn about each employee – their personal story, goals and ultimately what motivates them. Listen: Seek ideas from all levels of the organization. “Give the quiet ones a voice” and create a culture of listening in your team. Clarify: push yourself and your direct reports to understand and convey thoughts more clearly. Debate: Once the idea is clear, it is time to debate it with the team. I’ve set up improvement systems in several organizations and the “clarify” and “debate” steps always led to the most learning about the process, values, regulations, etc. by all employees. Scott recommends separating debate meetings from decision meetings. Decide: Push decisions into the facts, or pull the facts into the decisions. But keep personal egos in check. Create a clear decision making process that empowers people closest to the facts to make as many decisions as possible. Persuade: Once a decision has been reached, it is time to get more people on board. Use emotion, credibility and logic to make your case. Execute: As a boss, you must balance your leadership responsibilities with the need to execute. Scott shares three of her learnings: Don’t waste your team’s time, keep the dirt under your fingernails, and block time to execute. Learn: It is important to have the discipline to reflect and learn from the change initiative. Where could results be a lot better or are simply no good? What should we do differently next time? 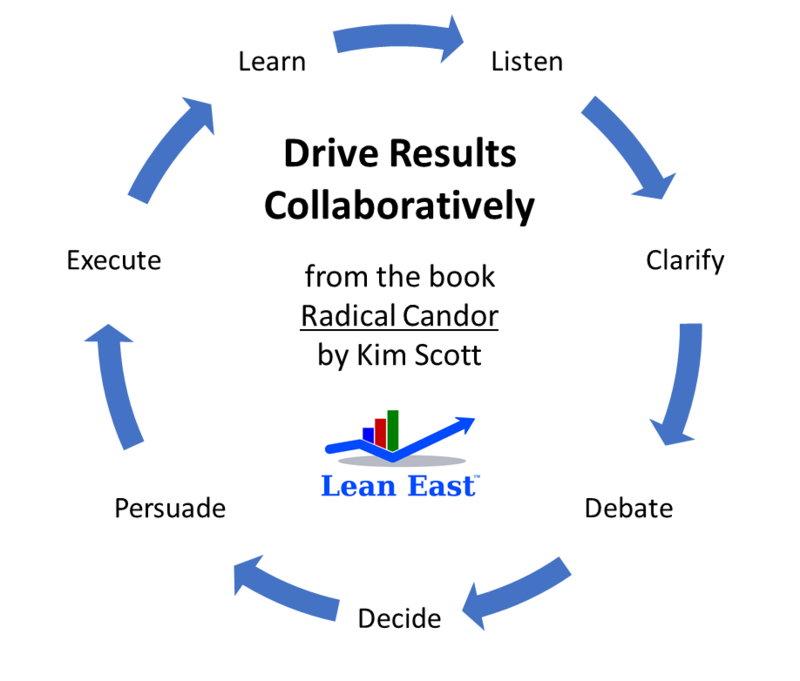 Check out this awesome mind map created by the Lean East team for the book. 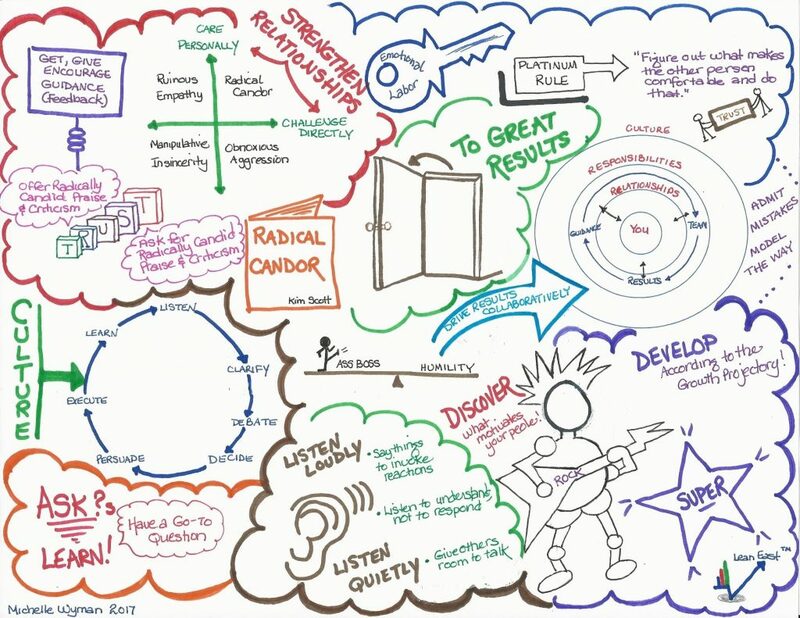 Connect with Michelle Wyman and Lean East for coaching on becoming a leader with radical candor and for support in creating an organization based on radical candor principles.